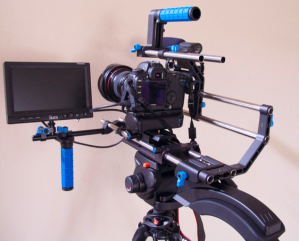 The MCS (Master Cinema Series) style rigs may not be in everyone's budget, but here's an informative video on different shoulder rig configurations from Letus. Posted in letus. 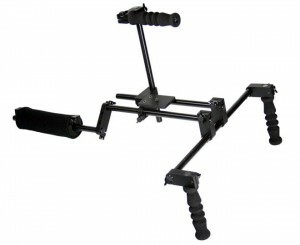 Tags: DSLR Shoulder Rig, Letus Master Cinema Series, Letus MCS on December 9, 2011 by Emm. 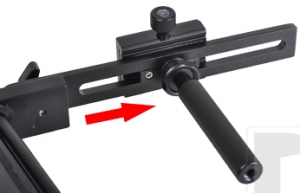 This new adjustable shoulder camera stabilizer, is a simple design. A pad that wraps over the shoulder combined with a long chest plate supports the weight of your camera. 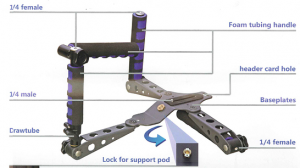 An adjustable / rotatable stage with support handle positions the camera. Simple but effective, especially for super small video cameras. 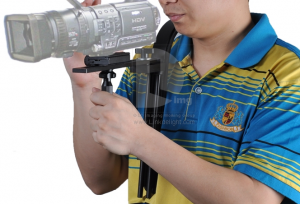 Video Camera Shoulder Support Stabilizer w/ Compass? Posted in dslr stabilizer, Equipment Reviews, Videography Gadgets. 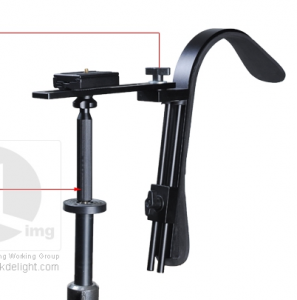 Tags: Camera Stabilizer, DSLR Shoulder Rig, stabilizer compass, video stabilizer on September 11, 2011 by Emm. Now that the SmallHD DP4 and Zacuto EVF have made electronic viewfinders for DSLRs (somewhat) affordable, you'll see some popularity around straight inline shoulder rigs. 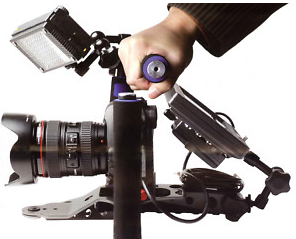 Popular DSLR rigs used an offset to place the entire camera in front of the operator. Although DSLRs are light weight, once you add a few items like recorders, lights, microphones, and follow focuses, you're managing a few pounds over the hands. Pretty tiring and less stable. Like conventional video cameras, the straight inline rigs align all of the heavy weight over the shoulder (better on your back) and less outwards over the hands. Only the EVF needs to be positioned in front of the operators eye. 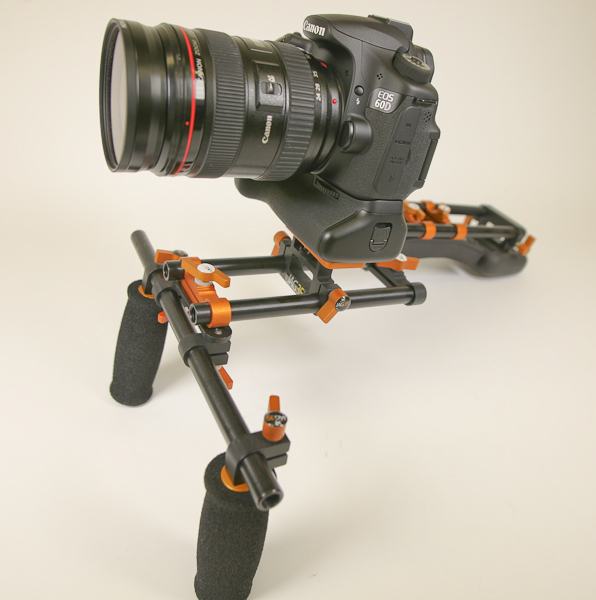 Straight inline DSLR shoulder rigs + an EVF can help you towards building a more balanced, stable rig, not to mention overall lighter on the hands. If you're not looking into an expensive EVF, you can still offset an inexpensive small LCD monitor (as seen above). Instead of dropping a few grand with a Redrock config, there's a few similar rigs you might want to look into over at Express35. These straight inline shoulder rigs are bundled with a comfortable contoured shoulder pad and counterweight. 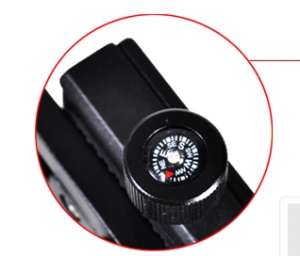 These are well designed for EVF or small LCD monitor use. (seen above). You can find those rigs at the site (click here). If all you're looking for is a DSLR baseplate, Tripod Mount, and a basic rail set for your Follow Focus, there's also a weekend sale on the basic rail set going on right now too found here. Posted in smallHD, zacuto. 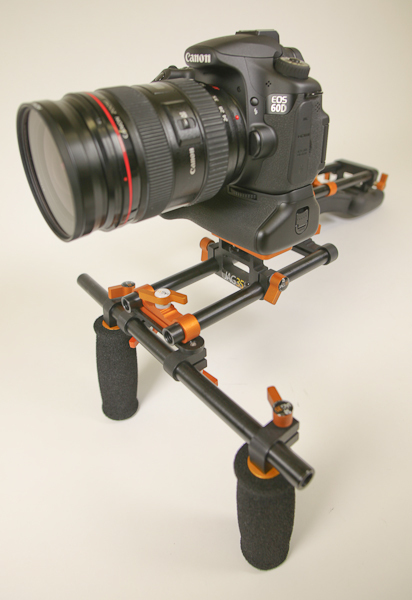 Tags: DSLR Shoulder Rig, express35, smallHD, SmallHD DP4 vs Zacuto EVF, zacuto on July 17, 2011 by Emm. 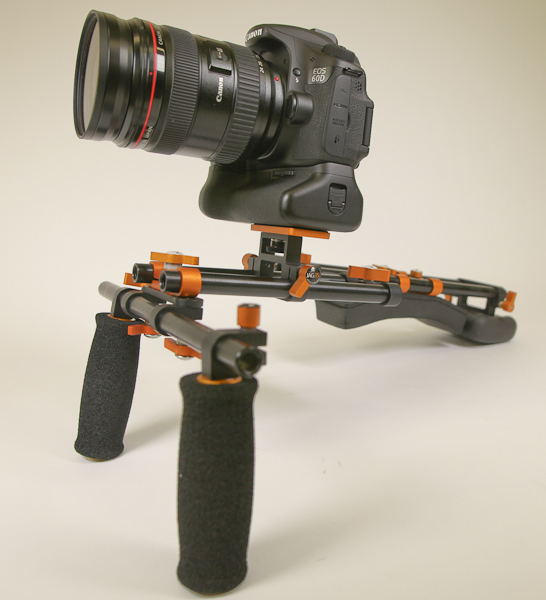 An interesting start to a DIY DSLR shoulder rig inspired by the twist handle shift method. This time YouTube member geedubya101 uses a grip shifter from a bike and runs the firm cable to the lens. 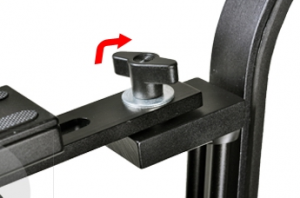 Another piece being used is a rotating flash bracket to add a side handle and some extra mounting options for accessories. Everything you need to know is all in the video, and it looks like it will be a cool little shoulder support when it's all done. 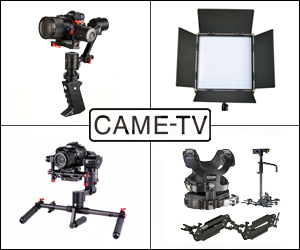 Posted in DIY Equipment, dslr stabilizer, Videography Gadgets. Tags: diy follow focus, DSLR Shoulder Rig, grip shift follow focus on March 12, 2011 by Emm. 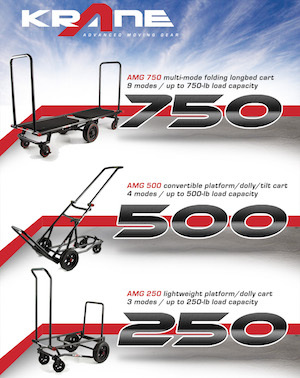 It's bound to happen, so here's another version of a ready made rotating video dolly newly to the market. This one comes from the little known company Lensse. 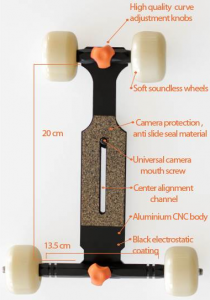 Obviously it does what other rotating dollies can do, but unless it's wider than what appears in the photos, the narrow stage doesn't seem like it's going to be practical for some type of a Fluid head mount. Hmm..might be good for tiny cameras and a mini fluid head? 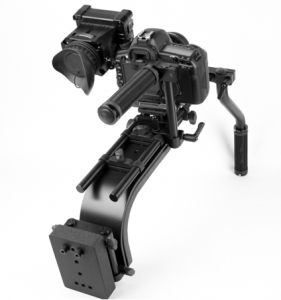 Next one (above) looks very similar to a DVTEC MultiRig Pro. If you're not familiar with what that is, you can find some Vimeo videos here: http://vimeo.com/search/videos/search:dvtec/e30032e7. 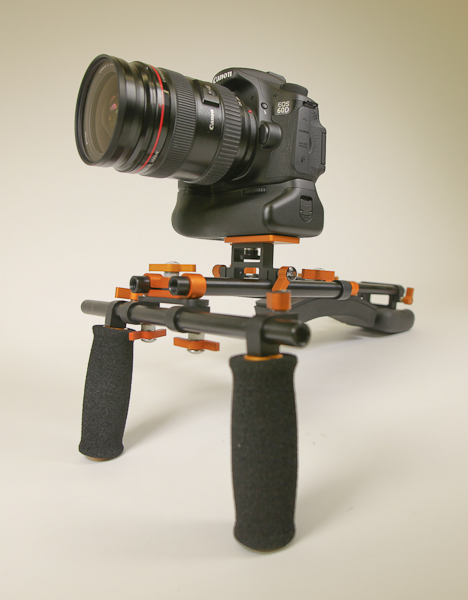 It's a multi configuration type rig that can go from shoulder support to handheld. Doesn't look to have all the pieces of a true DVTEC, but it doesn't have all the price of one either. 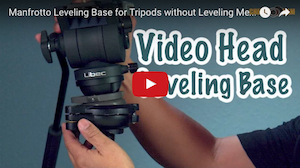 You should check out the link below to see all the different configurations this type of camera support can origami into..
Next item (below) another Video Stabilizer based off of the Merlin, Hague, Lensse, IndieHardware design. Yeah I know right? Even clones can get cloned. Well to be fair, it looks closer to the IndieHardware over anything else. Love the write up in the auction about being 'The Secret Weapon" and "Latest Innovation". LOL. While the others are set on pricing, at least this starter is throwing out a few auctions. Posted in dslr stabilizer, Equipment Reviews, Videography Gadgets. Tags: camera cage, DSLR Shoulder Rig, dvtec multirig, skater dolly, spidertrax dolly on February 22, 2011 by Emm. 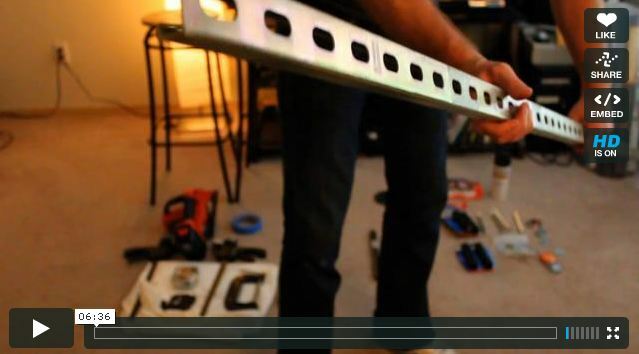 Vimeo member Tim Perkins looks to be a clever DIY guy. You can see him working a DIY LCD Viewfinder on his 550D. This time Tim takes a hint from a previously shared video found here: http://cheesycam.com/tripod-to-shoulder-support/ about using a tripod as a simple 'shoulder support' and finds gold in an old Bogen 3D tripod head. Using a monopod for the shoulder support, the configuration of this Bogen 3025 3D head helps position the camera to a better viewing height as well as being offset. Looks pretty stable as is, but curious if a handle, shoulder pad, and some counterweight could add some enhancements. 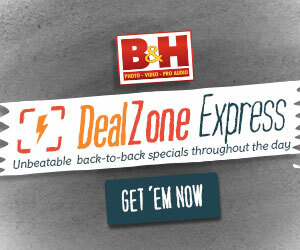 Posted in DIY Equipment, dslr stabilizer, Videography Gadgets. Tags: DIY dslr rig, DIY shoulder support, DSLR Shoulder Rig on October 14, 2010 by Emm. 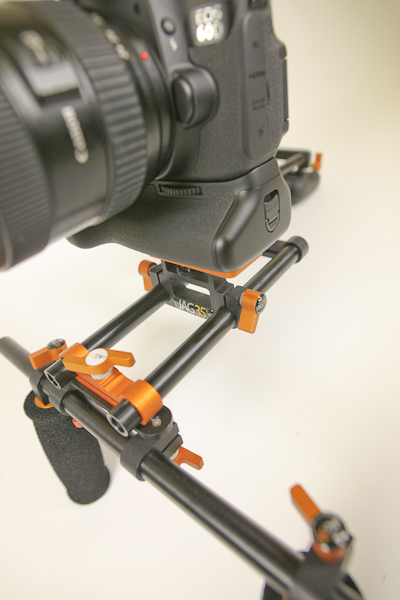 There's a new DSLR rig player in town with prices that aren't even in the competitions range. 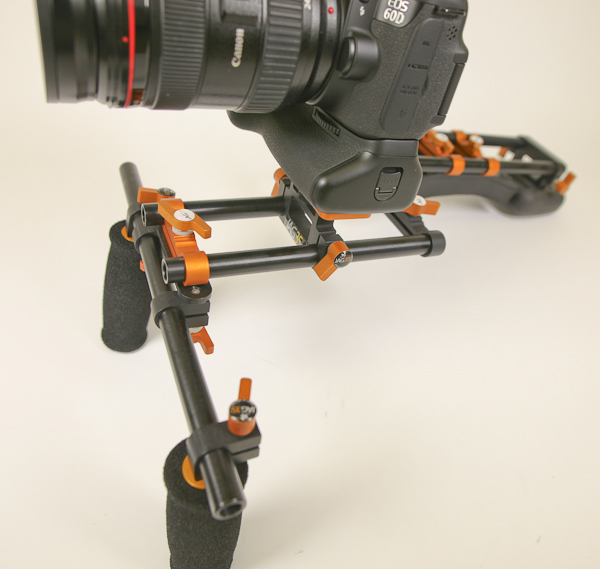 Then again, the configuration of this DSLR rig is cleverly assembled using many of the same parts keeping manufacturing to a minimum and costs low. 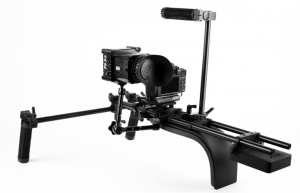 Coming in with a price to compete with the new shoulder rig from Jag35, this DSLR rig seems to be aimed directly for the budget film maker or serious hobbyist. Personally i'm more of a fan of the flat black on this rig, over the colorful Jag35 DSLR shoulder rig (not yet named). Actually i'm going to call this rig 'Cheaper' than Jag35, since i'm sure Jag35 will have shipping charges and possibly tax applied. Right now you can grab this new DSRL rig on ebay + free shipping. Very happy to see more players in the game, it benefits us small time buyers, eventually forcing product costs lower to compete. By the way, black Rods are actually more expensive due to additional coatings applied. This one doesn't spare on those important aesthetic details.You can find the new DSLR rig by eBay seller Express35 following this link. 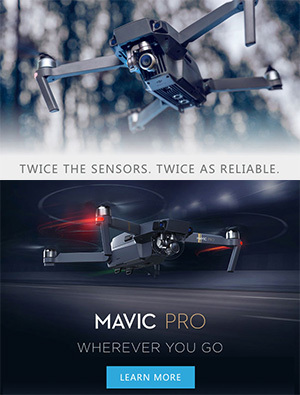 Posted in Equipment Reviews, Random, Videography Gadgets. Tags: dslr rig, DSLR Shoulder Rig, express35, rods on July 2, 2010 by Emm. First of all, I want to apologize if i'm not very responsive to many of the comments or emails that come in. I'm pretty overwhelmed with the response this blog has, and being a one man show, i'm trying my best! I'm an average guy, with an 80 mile commute (one way) in the mornings, I get home late at night, hang out with the kids & family, but still try to take time responding to questions, posting informative information, and sharing my most random DIY ideas. Don't worry though, my eyes are open to the work you do, and I enjoy sharing everyone's hard work, especially those who always link back. 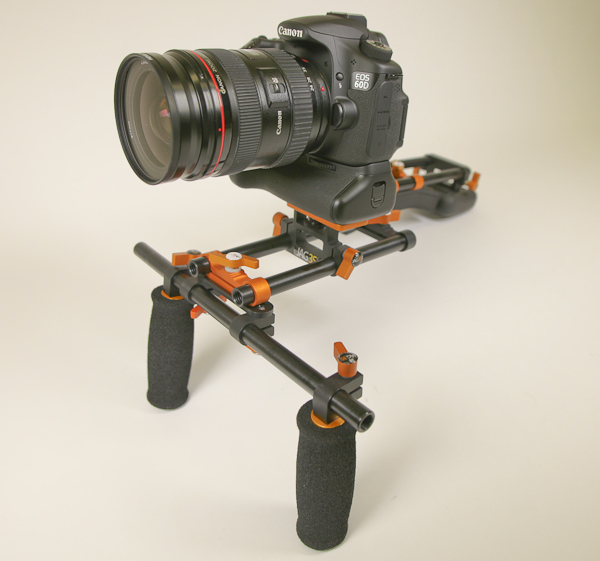 Case in point, I just ran into this DIY DSLR support rig video. He never contacted me asking to share this video, but by linking back to the blog, I get alerted by these pingbacks. I keep saying how I run though my DIY build videos so quickly sometimes, and I may not be as informative about how it all comes together. (sorry!). I'm not that fortunate to have another person interested enough to hold the camera for me. In any case, enjoy some of these recent videos that produced the DIY information better than I could. Thanks for taking the time to clear up things i've missed, and for sharing your work with the rest of the DSLR community. Make sure to leave them some nice comments, thanks guys. Another great video I wanted to share is this one by JCN. Using the IndiSlider (see i'm still plugging you IndiSystems), and the Reverse Macro trick, referenced to this blog, JCN pulled off some very nice footage from the Canon 550D / T2i. 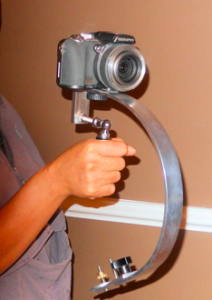 Posted in Cheesycam $20.00 Shoulder Rig, Cheesycam DIY Stabilizer. Tags: Cheesycam DIY, DIY, DSLR Cage, DSLR Shoulder Rig on June 23, 2010 by Emm.